New features and updates are still coming up every day as users and critics explore all the offerings that Apple revealed in the ‘Back to the Mac’ event last week. Apple updated its iLife suite massively and gave a run down of the new features but still a lot of great new updates were not mentioned in the address. A major upgrade to the iMovie feature is making waves everywhere as iMovie 11 now lets you export HD 1080 P video to YouTube and a number of other platforms which is a great jump from 720 P that iOS currently supports. Apple mentions on its official website that now you can publish your movies in more ways to more places. You can export movies to iTunes and watch them on your iPhone, iPad, iPod, or Apple TV. Share them with your friends on Facebook. Premiere them with a YouTube or Vimeo audience. Publish newsworthy content to CNN iReport. And you can create a video podcast in iMovie and send it directly to Apple Podcast Producer. When you export HD video at full 1920-by-1080p resolution, whatever you share will stun everyone. 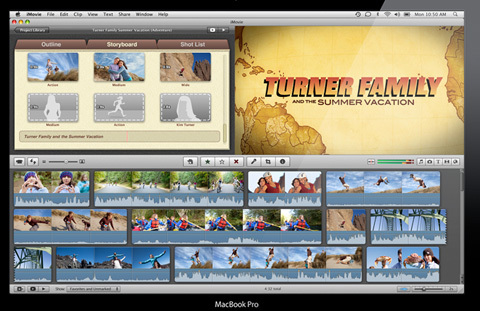 You can check out the official iMovie 11 page here to find out all the amazing new features that iMovie 11 now offers.